London agency Spacemakers has brought together design studio Silo and a group of young people to create a range of public seating. Designed specially for use in a forthcoming square in Wealdstone, northwest London, the furniture has been designed as part of a new public design project that engages young people in the area. Called the Wealdstone Youth Workshop, the project has seen a group of local 17 and 18 year olds – Esther, Marius, Tanya, Leo, Katy, Danica, Kayleigh and Marina – working with multi-disciplinary designers Silo to research, design and produce the furniture over a period of six months. Using a technique they refer to as "handmade hi-tech", Silo's work borrows industrial processes and materials ordinarily used for mass production and adapts them for small-scale production. Using this method, it aims to develop the "expressive potential" in industrial materials. Previous projects include a line of furniture made by steaming polystyrene beads inside fabric moulds. Made in the UK, the Wealdstone Leg is a multifunctional component that forms the basis of the Wealdstone Youth Workshop's collection. While it can be used as a leg, an arm or a bracket, it will be form a part for a range of stools, benches and chairs for the new public square. 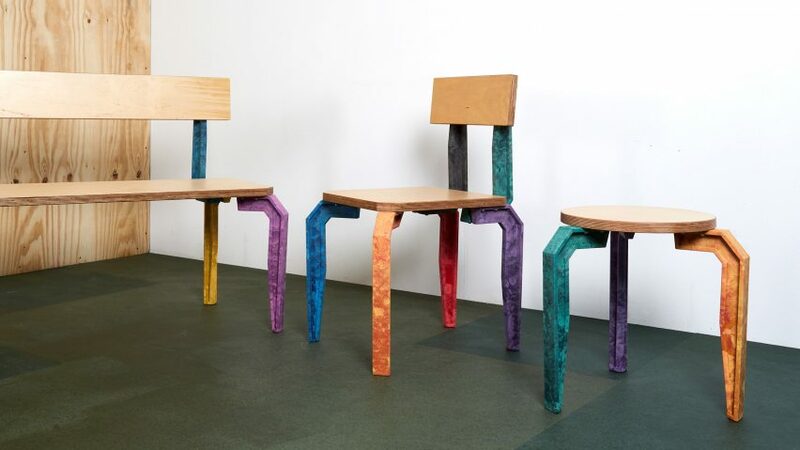 The unusual legs are made from a mixture of 60 per cent polypropylene and 40 per cent sustainable paper pulp, which that gives each a unique colour. The multicoloured legs are designed to be used together at random. The Wealdstone Legs are also available to buy with all proceeds going back into the project. The youth involved in the project each receive a royalty percentage on each sale, along with a small stipend of £500 for taking part. "The project was a response to the situation we found in Wealdstone," said Spacemakers. "We were initially asked to find new users and create new uses for the new square. We quickly realised, however, that the community had bigger problems: namely, a lack of activity for young people due to cuts to youth services, and the resulting negative perception of young people hanging around the town." "We set out to create a project that could change this dynamic, by putting the young people at the centre of what was happening in Wealdstone, and working with them to create something the rest of the community could use," they continued. Part of a wider project by Harrow Council to create a new public space at the centre of Wealdstone that can bring the community together, the Youth Workshop project will help to change perceptions of both the youth and the area itself, according to Spacemakers. The overall Wealdstone Square project is being led by architecture studio We Made That, with Spacemakers, Europa and others in support, while Karolina Cialkaite provided assistance with the furniture project.